Step into a world of strange rituals and ancient practices with this online video slot provided by Endorphina. 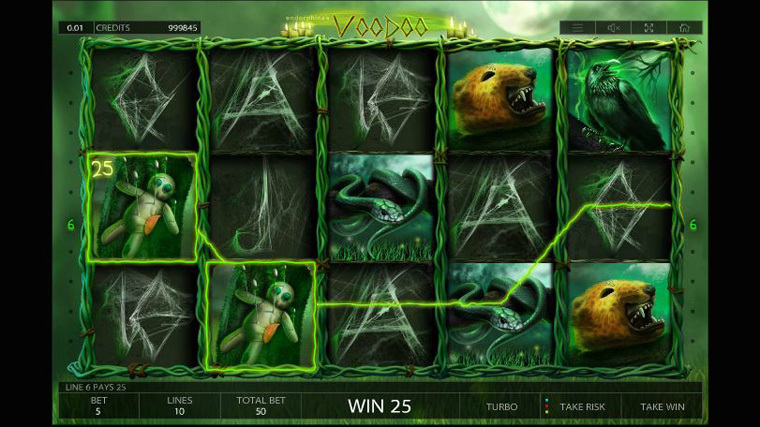 Voodoo will either thrill you with its features or send shivers down your spine. As you spin the 5 reels and 3 rows to land on any f the 10 fixed paylines, symbols like a voodoo shaman, a crow, a snake and voodoo priestess will display. Even the low-paying a, k, q, j and 10 are designed to make an impression. With an RTP of 96% and high variance, you can expect thrills both from the gameplay and from the rewards involved. Baron Samedi – this symbol plays both the Scatter and the Wild. Landing 3 anywhere, will trigger the Free Spins bonus level. It will replace all other symbols, to form more rewarding combinations. Free Spins – 3 Baron Samedi symbols grant 10 Free Spins, that can be retriggered. Expanding symbols – are active during the Free Spins. The symbols involved in any winning combination, expand and fill the entire reel they are on. Gamble – every time you land a winning combination, you can either keep the win or choose to double it. All you have to do is play a game of cards – pick one of 4 cards if it is higher than the house’s card, your winnings are doubled.